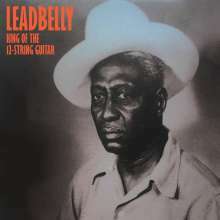 Der Artikel Leadbelly (Huddy Ledbetter): King Of The 12-String Guitar wurde in den Warenkorb gelegt. Huddie William Ledbetter, better known to the world as Leadbelly, was one of the most celebrated guitarists and vocalists of 20th century American music. He introduced the world to many traditional folk and gospel songs and his versions remain some of the most well known and beautiful ever cut to tape. Born on a plantation in Louisiana in 1888, Leadbelly got his start as a teenager performing in the red-light district of Shreveport. »Discovered« by the legendary folklorists John and Alan Lomax while Leadbelly was serving time in Angola state prison for attempted murder. They recorded him while in prison and in 1934, at the age of 46, made these recordings, the first commercial recordings of his career. Featuring a wide repertoire of folk and blues songs along with his powerful voice and unique guitar style, these tracks are absolute cornerstones of American folk and blues music and some of the greatest tracks he ever cut.